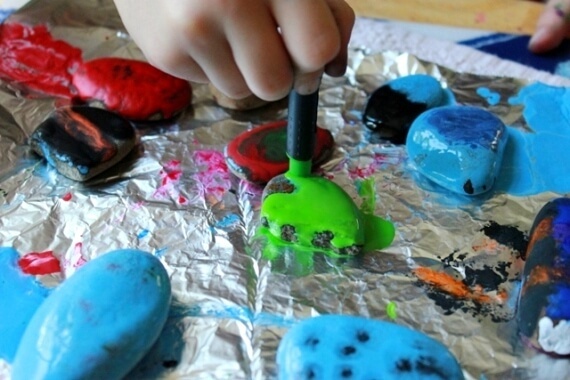 How to Make Melted Crayon Rocks - A Favorite in Our House! Melted crayon rocks are made by “painting” on hot rocks with crayons, which melt as they touch the heated rock. This post shares tips and tricks for success. Aren’t these melted crayon rocks beautiful?! This is something we’ve done a few times over the past few years and is one of our favorites. I could have sworn I had posted about this before, but I guess not. The rocks shown here were “painted” by Maia with the melting crayon. She especially loved the light blue and melted the entire crayon down to a nub. A Note about Crayons: Any crayons will work, however, we’ve found that beeswax-based crayons and soy crayons work a bit better than petroleum-based crayons. The coating ends up waxier and more opaque. More beautiful! We are lucky to have a good supply of small rocks in our backyard. We gathered a colander full and washed and dried them. I spread the clean rocks out on a foil-lined cookie sheet and put them in a 350 degree Fahrenheit oven to heat up. Once the rocks were hot, we transferred them one or two at a time to a protected surface to work, leaving the rest in the oven. The table was protected with a placemat, a washcloth, and a piece of foil. Possibly overkill. The foil is pretty necessary to catch the melting crayon and I think a washcloth or towel is wise to keep the hot rock from damaging the table surface. Have you tried making melted crayon rocks? The crayon melts over the surface of the hot rocks and creates a smooth, vibrant, colorful coating that hardens into a waxy shell. It is SO satisfying. A tad addictive even. After working on this batch of rocks together while Daphne napped yesterday, Maia collected a second batch of rocks to work on with a friend. The melting crayon is so liquid it’s like painting with crayons. You can use one color or several. Make designs, swirls, dots, stripes, faces, whatever. We used a variety of crayons, but mostly these push-up wax crayons, just because they were handy at the time and work so well. Plus the plastic handle keeps the crayon safely long even when the actual crayon piece is down to a nub. Note: The Jolly push-up crayons shown here no longer seem to be available. However, we have made these rock crayons with many different kinds of crayons. These beeswax crayons are our favorite for this activity. Here are some of Maia’s melted crayon rocks. If you haven’t done this yet, give it a try! And if your kiddos are too young to be working with hot rocks, then do it yourself while they nap. I bet you’ll love it. You can also make melted crayon sea shells! This looks like our kind of fun! My son has a rapidly growing rock collection and I’ve seen many ideas for “story rocks”. Whoever his most loved rocks morph into a pizza slice or an airplane within minutes of each other so I have left them organic. I love this idea because it leaves imagination intact. Just yesterday I read your article about sewing a dress with pockets for Maia because your hands were full of her rocks when she was little. It was especially sweet for me to see this post today. Thank you for sharing. One of our family’s favorites! Here’s another twist on the same fun: Color on rocks or even paper or cardboard. Place the colored works in the sun for the day and check on them now and then to see how the crayon is melting. You need a hot day and full sun. Gorgeous! We will definitely do this soon. We just made these and it was so much fun! It was interesting to see the difference between the Rose Art crayons which were very translucent and the Crayola crayons which were more vibrant. My son had fun and I like activities which help him develop concentration because he has to be careful. Thanks for the idea! A great project, indeed…my 9 year old loves it. We did this about an hour after I read your blog. It was a smashing success. Thank you once again for the inspiration. My whole family benefits! Thats really creative. We have tried melting crayons with a candle and putting them on paper, but this is so much more fun. Yes, there are lots of differences between crayons and sometimes they come out more in projects like these. That’s interesting about how he plays with the rocks. Maia and Daphne haven’t been playing with ours as pizza slices or airplanes or whatever. Rather, they’ve been arranging our rocks into circles and, in Maia’s case, into letters and such. We’ll have to try coloring them first and then putting them in the sun to see if they melt. Although it’s hard to beat the fun and immediate gratification of melting the crayon on the hot rocks. Perhaps we could take our crayons outside on a hot day and see if the rocks are hot enough to melt the crayon. Yay! Have fun with it. I’ll definitely have to try this at home with Aria. We already have quite the rock collection since she insists on gathering new ones every time we leave the house. She isn’t really into crayons all that much as she prefers her watercolors and markers but I bet a project like this might elevate those crayons to a place of honor. :D Thanks for the idea!! So glad it was such a success!! Thanks. We’ve melted crayons and painted with them (with paintbrushes), but it wasn’t terribly successful for us. I think our melted crayon was too cool or something. They’re really beautiful. I’m concerned about washing them ahead of time because water trapped in a rock and then heated turns into steam that, to escape, will explode the rock (that seems to be a pretty well known idea around, but was a total surprise and scare to us at a beach campfire one night!). Maybe just a very slightly damp cloth to wipe off any larger particles on the rock? This is such a fun idea. We’ll do this at our next homeschool gathering that happens on a rainy day. It seems like the perfect thing for kids of any age. I’M excited to try it. Our gardens are sprinkled with surprise drawn upon and colored rocks of all kinds, such fun to seek and find. Thank you for posting. I love this, nature and art is the best. Wish Naomi was old enough; will definitely remember this one. Thanks Jean! This looks like so much fun! We will have to give it a try. Apparently, there’s a world of amazing melted crayon art going on out there! Fabulous project for art camp. So glad I found your blog! These look just wonderful! I love rocks and since I can’t help collecting them, I’m always on the lookout for interesting ideas. Can’t wait to try this! Aillsa – you could make a solar oven – a foil-lined box with a piece of clear glass or plastic on it, placed in full sun for a bit, should make the rocks warm enough to melt the crayons. Be careful to use appropriate hot pads/oven mitts when handling the rocks. My son (9) loves to make these ovens and cook hot dogs on a skewer for his brother (5) and himself. Just a thought. Thank you!My girls loved this project! Sure you can!Boiling them would do the same thing! Do you seal them after they dry? If so, what type of sealant? Can you recommend a sealant? I just made these with my kids and now I have crayon on my bedspread! My kids love carrying things around in their hands….